Kendal Mountain Festival once again delivered an array of events, speakers, films and literature that celebrated the full extent of the mountain community. Mountain Heritage Trust were in attendance seeking out the very best mountain heritage and speaking to members of the public throughout the weekend. 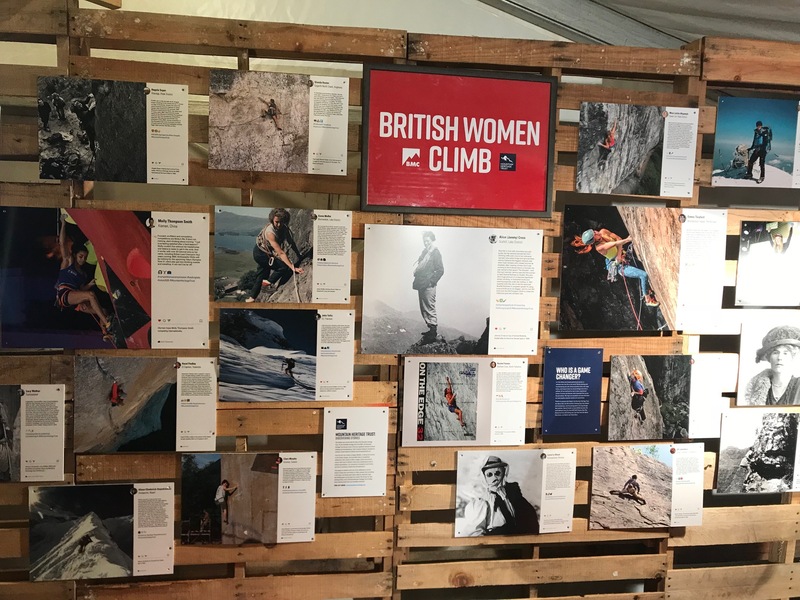 In Basecamp, the BMC stand celebrated the achievements of women climbers across history, taking inspiration from our British Women Climb exhibition at Keswick Museum which has been extended until February 2019. The likes of first female E1 leader Alice ‘Jammy’ Cross and high-altitude pioneer Alison Hargreaves were pictured alongside modern icons Molly Thompson-Smith and Shauna Coxsey. Also on display was classic climbing equipment offering a chance to get hands on with some real pieces of history. Items from the 1950s and 1970s was displayed alongside the iconic Sprayway down suit used by Alison Hargreaves on Everest. KMF also delivered a stellar line-up of heritage events. Nick Brown’s new film ‘Statement of Youth’ produced in conjunction with UKClimbing.com surmised the story of the notorious 1980s climbers who obliterated the standard of the day, raising the bar from 7b+ to 9a. Full of wit and outrageous behaviour, the preview was attended by a diverse audience of both young and old. Other film events included the Royal Geographical Society screening rarely seen films on Everest alongside research by historian Jonathan Westaway. Elsewhere, word quickly got out that a secret session on Saturday was showing an up-coming film on Hamish MacInnes and ensured a packed audience. Covering an expansive career, ‘Final Ascent’ poignantly captured not only MacInnes’ life, but how he recently his recently ailing memory back together with his extensive archive of books, images and films. The UK premiere is set for 2019. Filmmakers, archivists and academics also came together to celebrate a historic take on the modern ThisGirlCan movement. ThisGirlDid explored the iconic ascent of Scafell by Doroth Wordsworth on the 7th October 1818. The ascent was re-created and filmed earlier this Autumn and the session provided a welcome insight into the achievements of the early pioneer and her impact on modern day hill walking. The weekend marked the start of an exciting time at Mountain Heritage Trust who are in the process of developing a brand new website and launching some exciting joint campaigns with the BMC in 2019.